The glasshouse tomato industry has been an important export income earner for South Australia over almost a century. The low incidence of frost and a high winter sun levels favoured its early development on the Adelaide Plains, initially around reed beds on the River Torrens near Lockleys. By the late 1920’s a thriving glasshouse tomato industry was established in Adelaide’s western suburbs with most of the crop being marketed in Melbourne. With encroaching urban development, the industry moved from Adelaide’s western suburbs to the Northern Adelaide Plains and Murray Bridge in the late 1950’s and 1960’s. Since 2000, it has gone through further modernisation with the introduction of automated controlled environment glasshouses and hydroponic production systems. Source: State Library of South Australia B48539. It is unclear who first started producing tomatoes in glasshouses in South Australia. In the SA Department of Agriculture Bulletin No 6, “Production of Early Tomatoes”, author Mr George Quinn acknowledges early production of tomatoes on the property of Mr E. Sanford at Fulham in 1905. This involved using glass covered forcing frames heated by fermenting animal manure enabled sowing to occur in June and early raising of seedlings. Tomatoes were then transplanted into protected areas, with each plant sheltered by a half kerosene tin, and trained onto a stake or bamboo. Early protected tomato production, Fulham 1905. 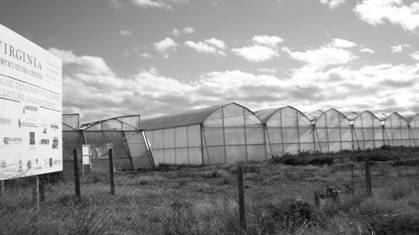 The construction of glasshouses for early tomato production commenced prior to WW1. An article in the Advertiser on 18 October 1916 lists a number of growers operating in the Lockleys area including Mr J.G. & Mr A.H. Dawkins, Mr .H. Hayman, and Mr S.H. Sherriff, while several Skuse family members operated properties at Fulham Park and Underdale. Prior to developing his enterprise, Mr E. Skuse traveled to England researching the latest hothouse tomato growing techniques and glasshouse design (large scale glasshouse tomato production commenced in the Worthing area on the south coast of England in the late 1890’s). Newspaper articles from 1916 reported the use of large glasshouses 120 to 150 m long and 12 to 15 m wide. Training and support of plants had moved from individual plant stakes to strings run from overhead wires suspended in the roof of the glasshouse. Considerable development occurred in the 1920’s. In 1928, a Fruitgrower’s and Market Gardener’s Association survey indicated that there were more than 150 growers producing from over 750,000 plants. Water for these crops was being sourced from the River Torrens, bores and wells, and reservoir mains. While most of the production was in the area west of Adelaide, there was also some glasshouse production in Salisbury, Nelshaby, Barmera and Mc Laren Flat. Adelaide Plains harvest was from August to December, with the majority of fruit being sold in the Melbourne market. Fruit was being packed in wooden half bushel boxes, and consigned to Melbourne on three train services per week. In October 1928, about 12,000 cases were being exported to Melbourne per week. Early SA glasshouse tomato growers experienced some competition in the Melbourne market from outdoor tomatoes grown in Geraldton W.A. However, Geraldton growers were at a significant disadvantage because of the time and cost in railing fruit to Melbourne via Perth and Adelaide. Expansion continued through the 1930’s with over production being a major issue in 1935. Marketing during WW2 was controlled for defence purposes. By 1943-44, there were 79 ha of glasshouse tomato production. Further expansion continued post WW2 and by the 1949 season, SA glasshouse growers were exporting more than 300,000 half bushel cases of tomatoes to Melbourne each season. There were also a significant number of glasshouse growers operating near Pt Pirie around the Nelshaby district during the 1940, 1950’s and 1960’s. The low frost incidence of this area coupled with a warmer climate than the Adelaide Plains gave earlier maturity and a price advantage for these growers. Fruit was railed to Adelaide, then on to Melbourne. However, this district declined by the 1970’s due to competition from Queensland and difficulties with increasing salinity of groundwater. Young established tomato plants in a multi span steel framed glasshouse c1960. During the mid 1950’s, urban development was encroaching on vegetable growers in what were to become the western suburbs of Adelaide. Real estate developers were buying vegetable growing properties throughout Marion, Lockleys, Fulham, Underdale and Flinders Park. Substantial underground water supplies had been discovered on the Northern Adelaide Plains, and vegetable growing properties were being developed in the Virginia, Two Wells, Salisbury, Bolivar and Angle Vale districts. 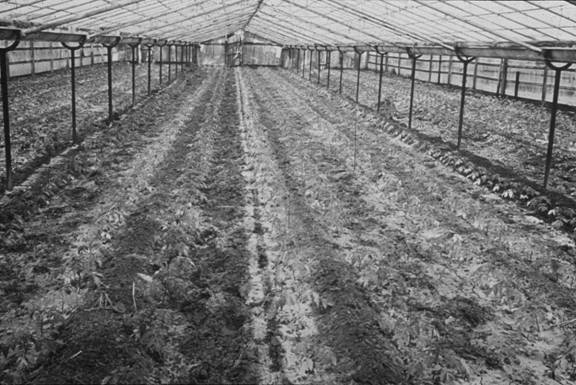 An exodus of glasshouse vegetable growers occurred during the late 1950’s and 1960’s as they sold their western suburbs properties and relocated to the Northern Adelaide Plains. Some also chose to relocate to Murray Bridge, and by the 1970’s about 10% of glasshouse production was established in this district. Major factors in choosing glasshouse production locations have been low incidence of frost, high light levels in winter, well drained soil, and availability of irrigation water. With the recent trend to controlled environment glasshouses, close proximity to mains gas and power supplies have become high priorities. development of cheap, reliable refrigerated road transport from Bowen and Bundaberg to Melbourne. introduction of determinate tomato varieties from the US (Floradade was the main variety) that grew well on a wire trellis and did not need pruning. These tomato varieties were smoother and more attractive. Supermarkets preferred them because they were hard, and gave minimal wastage in the retailing system. Consumers were unhappy with the lack of flavour. The loss of their traditional market created difficult times for SA’s glasshouse industry. Despite the change to new hybrid glasshouse tomato varieties in the late 1970s and early 1980’s (sourced from Holland), growers struggled to compete. Many switched to alternate glasshouse crops such as cucumber, capsicum, eggplant and cut flowers. The introduction of new controlled environment glasshouse technology from the late 1990’s onwards has seen a resurgence of glasshouse tomato production. The higher productivity of these new structures along with year round production, emergence of specialty types like cherry, grape and truss tomatoes, has seen the South Australian glasshouse tomato industry regain its competitive edge. Today the Adelaide Plains has the largest concentration of sheltered vegetable production in Australia with more than 800 ha under glass, poly or shadehouse production. South Australia’s glasshouse vegetable industry has been greatly influenced by migration booms over the years. The industry was dominated by “Australian” growers up until the early 1950’s, although there were a number of growers from European (mainly pre WW2 Bulgarian and Italian immigrants) backgrounds in the industry. However many post WW2 migrants coming from rural areas of southern Europe (mainly Greece, Bulgaria, and Italy) entered the industry in the 1950’s and 1960’s. This occurred because starting a glasshouse business did not require a lot of land, machinery and capital. Many of these immigrants worked in factories and held other jobs while they gradually got their glasshouse property established. A second wave of migration occurred after the Vietnam war, with immigrants from Vietnam and Cambodia entering the industry in the 1980’s. This occurred at a time when many of the earlier post WW2 European immigrants were looking to retire from the industry. Many of today’s glasshouse vegetable growers are from a Vietnamese or Cambodian background. Over the years, there has been considerable change to the design of glasshouses. Initial structures were based on the large wooden glasshouse designs copied from the UK. These large structures required skilled carpenters for construction, but enabled operation of horse teams inside the glasshouse for ploughing and soil preparation. Rotting of timber caused considerable leaking of rain through the roof (causing plant disease problems) and maintenance costs were high. 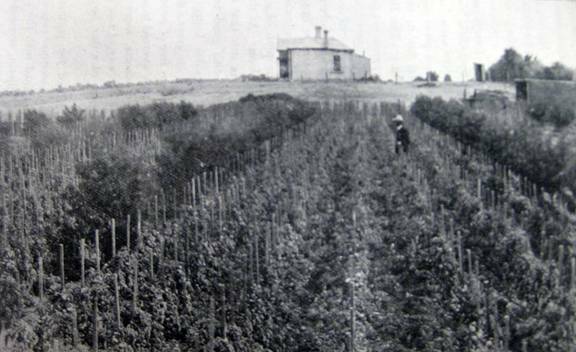 By the late 1920’s, growers had developed smaller and cheaper structures (approximately 30 X 4.5 m) that performed satisfactorily in Adelaide’s climate. Frames were still built from wood. In the mid 1930’s, Mr C.H. Hanaford (Henley Beach Road, Mile End) developed and patented galvanised steel glazing rafters. These were rolled from heavy gauge galvanised iron sheeting and were designed for use with standard (355 X 395 mm) sheets of horticultural glass. . The Hanaford glazing bars reduced construction and maintenance costs, and reduced shading in the glasshouse. Later development of clips for use between glass sheets gave better sealing, improved temperatures, and meant crops matured several days earlier. Initially horticultural glass was supplied from Belgium. WW2 interrupted supplies, and Australian glass manufacturers started supplying the industry, and continued as the main supplier after WW2. Fielder’s were major suppliers of nails, bolts, wire and other hardware used in glasshouse construction. Hessian string for training plants was imported from India. In the 1970’s, growers switched to stronger polypropylene training strings. Easier access to welding equipment after WW2 also led to the manufacture of steel glasshouse frames to replace timber. These were locally manufactured by Mr A.O. Modra at Hardy St, Underdale. Steel frames eliminated the need for centre support posts, making it easier to operate machinery in the glasshouse. Steel frames also enabled growers to build multi span glasshouses. The Modra company manufactured a range of small motorised cultivators or rotary hoes, and other items of equipment for use in glasshouses. Modra’s also developed early soil injection equipment for applying chloropicrin fumigants (use commenced in about 1944). Following devastating hail storms in the 1980’s, many grower’s began switching to various plastic and fiberglass cladding materials for their glasshouses. While cheaper than glass these materials degrade in ultra violet light, and have to be replaced regularly. They do not have the high light transmission characteristics of glass. 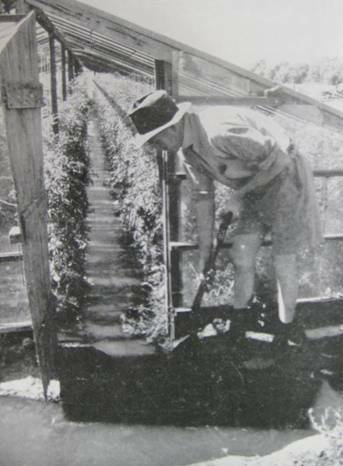 Flood irrigating glasshouse tomatoes c1950. Since the early 1990’s, European controlled environment glasshouse designs (mainly from Holland, France and Israel) in conjunction with hydroponic production techniques have gradually been adopted by growers. Heating (using natural gas) and evaporative cooling controlled by computer based management systems result in much higher productivity (60-70 kg of tomatoes per sq m), better pest and disease management, and better quality fruit. All early glasshouses were flood irrigated. 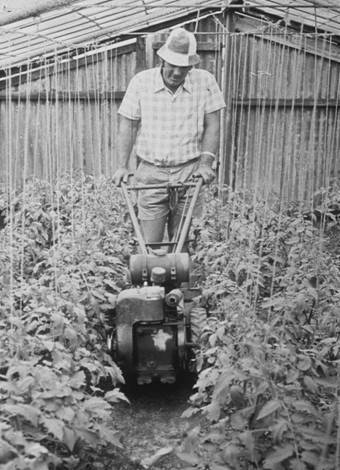 Use of drip irrigation started to become popular in the 1970’s. Many growers have now adopted hydroponic production systems that recycle water and nutrients. Virginia Horticulture Centre controlled environment glasshouse demonstration site – Virginia (2012). Nematodes and soil borne diseases such as fusarium and verticillium wilt were a major problem for tomato growers. When tomatoes were continually grown in an area, these devastating soil borne pests and diseases would kill many plants and dramatically reduce production. Initially growers avoided the build up of soil pests and diseases by moving glasshouses every 2-3 years. Glasshouses were built the width of a glasshouse apart so only the roof had to be moved, and it wasn’t necessary to reposition the side posts. However this process was time consuming, and required larger areas of land. Steam was initially used to sterilise soil. This required hire of a boiler and covering soil with hessian bags to minimise heat loss. During the 1920’s, there were experiments using various cyanide products as fumigants. However these products were highly hazardous to health. Use of the WW1 gas, chloropicrin, as a fumigant began the mid 1940’s. Other products were added with chloropicrin to enhance the control of nematodes. Initially these products were injected using a small walk behind motorised cultivator, followed by rolling and spraying the surface of the soil with water to hold the gas in the soil. A number of contractors fitted small Ransomes crawler tractors with fumigation rigs. 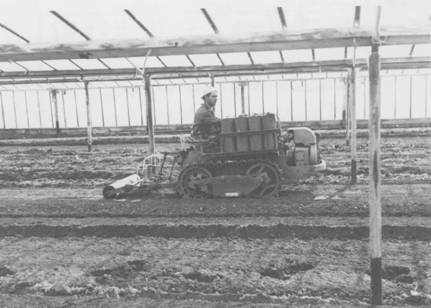 Fumigating glasshouses with chloropicrin using an injection rig mounted on a Ransomes MG6 tractor c1960. To reduce risks associated with using fumigants, legislation was introduced in 1975 requiring fumigation contractors to be licensed and for them to meet minimum application standards. Declining availability of chloropicrin resulted in a switch to methyl bromide as the main soil fumigant in the 1980’s. Production and use of these soil fumigants has now been greatly reduced because of their impact on the atmosphere’s ozone layer. Modern glasshouse tomato production is now focused on hydroponic systems, eliminating the need for soil fumigation. Following are some of the important technologies that have influenced development of the SA glasshouse tomato industry. Spotted wilt virus was a major problem in the 1920’s. Experimental work was conducted at Waite Agricultural Research Institute in 1927 to understand this disease and identify control measures. Mr Geoffrey Samuel, Plant Pathologist at the Waite subsequently published a bulletin on tomato pest and disease control in 1931. Experiments were conducted at Mc Laren Vale in the 1920’s with the use of calcium cyanide and hydrocyanic acid fumigants for control of soil nematodes. Leaf mould (Cladosporium fulvum) emerged as a major disease of tomatoes in Victoria in 1934. It spread to SA in 1935. Staff at Waite Institute played a role in assisting the industry to control this disease. Wasp parasites for control of white fly were introduced by Dr Davidson of the Waite Institute in 1936. This introduction occurred with cooperation of CSIRO and Mr A.G. Strickland, Chief Horticulturalist SA Dept of Agriculture. Introduction of the Ferguson/Ford tractor with 3 point linkage implements in the early 1940’s greatly reduced labour needs for hand digging soils. Post WW2, plant growth hormones began to be developed. During the 1950’s and 1960’s many growers used B napthoxy acetic acid on plants flowering during cold weather to improve fruit set. Care was needed with this product as it often cause “puffy” fruit. New varieties with improved cold temperature setting eliminated the need for this product. In the 1950’s a seed heat treatment service provided by the Dept of Agriculture helped reduce transmission of seed borne viruses. Overheating of tomatoes during the rail journey to Melbourne caused yellowing or “boiling” of fruit. Ian Rogers, Vegetable Research Officer with the Dept of Agriculture conducted a series of experiments on rail shipments of fruit during the early 1960’s. Fruit held at temperatures above 27C, developed this problem. A few growers invested in cool rooms in the late 1960’s. Pre cooling of fruit before shipment avoided spoilage from over heating and ensured much better quality in the market place. However most growers were reluctant to make this investment. From 1966, the industry gradually switched from row packed fruit in wooden half bushel cases to volume packed 10 kg cardboard cartons. This reduced packing labour. However the approach meant premium glasshouse tomatoes were not easily differentiated from outdoor grown tomatoes in the market place. A major tomato variety evaluation program was conducted by Dept of Agriculture researchers Norbert Maier and Geoff Lomman in the late 1970s and early 1980’s to improve competitiveness of the industry against outdoor grown Queensland tomatoes. This identified a series of European hybrid varieties (eg Nancy, Carmelo) with smoother more attractive fruit, improved productivity, and greater disease and nematode resistance. This variety assessment program changed production systems in the SA glasshouse tomato industry and was also extended to include cucumber and capsicum. A joint project between the Virginia Horticulture Centre and the SA Dept of Agriculture (with financial support from glasshouse manufacturers and Horticulture Australia) established a demonstration site at Virginia from the late 1990’s to about 2007. This demonstrated controlled environment glasshouses sourced from manufacturers in France and Israel, and hydroponic growing systems sourced from Holland. This provided growers with an opportunity to see first hand new glasshouse designs and how the latest production systems performed in their district. Up until the 1980’s, Melbourne was the main and most lucrative market for SA glasshouse tomato growers. Freight services for the industry were vital. Until the mid 1960’s virtually all fruit was exported to Melbourne via rail services. During the tomato season, growers would load onto three freight train services to Melbourne each week. Port Pirie growers would also rail fruit to Adelaide to link with Melbourne freight trains. At its peak, the industry also used separate rail freight trucks destined for Bendigo and Ballarat. Half cases of tomatoes were hand stacked in covered railway trucks at the Mile End freight yards. Some larger growers would have their own dedicated rail truck. These rail trucks were generally unrefrigerated, resulting in rapid decline of fruit quality in hot weather. Occasionally “icing” of rail trucks would be used in an attempt to keep fruit cool. By the mid 1960’s, the advent of faster more reliable semi trailers and improving roads resulted in the development of overnight road freight services to Melbourne. Rail services could not compete. The introduction of refrigerated road freight resulted in a rapid decline in the use of rail freight by the tomato industry. The SA Fruitgrower’s and Market Gardener’s Association (SAFMGA) was formed in 1904. In 1919, it established its first of a number of district branches at Marion in 1919. At its peak, the Marion Branch had 150 members. collection of a levy (a half penny per half case) to fund industry activities. coordinating marketing of fruit through appointed glasshouse tomato marketing agents in the Melbourne market. wholesale marketing of fruit in the Adelaide market. bulk purchasing of materials used by glasshouse growers including chemicals, glass, machinery, fertilizers, cartons, etc. coordinating rail transport to Melbourne markets. With introduction of road transport, various commodity sections of SAFGMA combined to establish Safrate. This business coordinated freight requirements for interstate markets and contracted services from various transport companies. inspecting tomatoes being loaded on rail trucks for export to Melbourne. Fruit that was not of satisfactory quality could not be forwarded to Melbourne and was required to be sold in Adelaide. Baker B.T. (1976); The legislative aspects of chloropicrin soil fumigation; Dept of Agriculture & Fisheries SA Leaflet No 4051. Kerr A., Edwards G.R., & Wishart R.L. (1959) Tomato Diseases in South Australia; SA Department of Agriculture Bulletin No 455. Lewis I.R. and Maier N.; (1981) Marketing of South Australian glasshouse tomatoes and cucumbers in Melbourne, with particular reference to the Adelaide Plains; Dept of Agriculture South Australia No1/81. Mc Glasson W.B. and Rogers I.S. ; The Melbourne market does not want BOILED TOMATOES; SA Journal of Agriculture, November 1960, P 166-168. Philp B.W. ; Glasshouse vegetable production in Western Europe – overseas study report; SA Dept of Agriculture Technical Report No 7; September 1982. Philp B.W. ; (1989) Glasshouse Tomato Production; Department of Agriculture South Australia; Market Development Paper No 12. Pinn A.J. ; (1930); Tomato Culture Under Glass; Agricultural Gazette of NSW, Vol 40, Pp 701-14. Quinn N.R. ; (1947) Tomato Culture in South Australia; Department of Agriculture of South Australia; SA Journal of Agriculture Sep-Dec 1947. Quinn G.; (1905, reprinted 1910, and updated 1926); Production of Early Tomatoes; Department of Agriculture of SA Bulletin No 6 and No 196. Rogers I.S. and Gursansky J.A. ; (1966); Tomatoes – Outdoor and Glasshouse; South Australian Department of Agriculture Bulletin No 405. Rogers I.S. and Baker B.T. ; (1971) Tomatoes – Outdoor and Glasshouse; South Australian Department of Agriculture Special Bulletin No 10.71. Rogers I.S. and Twigden T.K. ; (1979) Glasshouse Tomato Production; South Australian Department of Agriculture & Fisheries Horticulture Notes. Samuel G. (1931); Tomato diseases in South Australia and how to control them : with special reference to glasshouse tomato culture; Dept of Agriculture, South Australia Bulletin No 249. Wishart R.L. & Rogers I.S. ; (1960); Tomatoes as a Market Crop; SA Department of Agriculture Bulletin No 405. Special thanks are extended to Mr Rex Curtis for his assistance in preparing this information. In partnership with his father (Mr H.E. Curtis) and brother (Mr M..A. Curtis), Mr Rex Curtis’s family grew glasshouse tomatoes at Underdale and Bolivar from 1930 to 1986. Mr Curtis was also Chairman of the Fruitgrower’s and Market Gardener’s Association Tomato Section from 1977 to 1986.